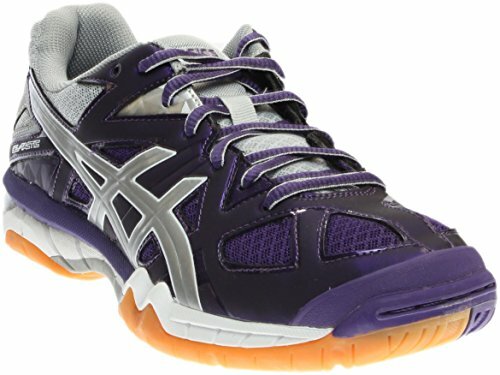 An update to the popular 1100™ series, the GEL-Tactic™ comes equipped with top-of-the-line technology for excellent support, comfort, and durability on the court. Combination synthetic leather and air mess upper for improved performance and breathability. Toe guard improves durability. Lace closure for optimal fit. Two layer SpEVA® Midsole Material improves bounce-back characteristics and decreases midsole breakdown. Rearfoot GEL® Cushioning System attenuates shock during impact phase and allows for a smooth transition to midstance. Trusstic System ® reduces the weight of the sole unit while retaining the structural integrity of the shoe. NC Rubber® outsole compound containing more natural rubber content than traditional solid rubber, resulting in enhanced traction on court systems. Imported. Measurements: Weight: 10 oz Product measurements were taken using size 8, width B - Medium. Please note that measurements may vary by size.